Cut your dinner prep time by using the Colri+ sharp knives! Cut your dinner prep time by using the sharp knives Colori+ Kuhn Rikon! Sharp knives are essential for every kitchen and when you find an awesome set like these Kuhn Rikon knives, you’ve just got to shout it out to the world! These stainless steel colorful blades are made to stay sharp and handle daily use! 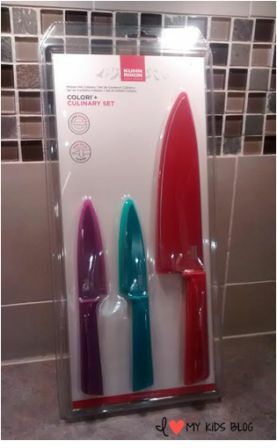 I received the Colori+ Culinary Set which included three sharp knives. A pairing knife, a serrated paring knife, and a chef’s knife. I’ve had the same knives for several years and I have disliked them for almost that whole time! They are the old wood ones that were great for the first 3 months of their use but aren’t dishwasher safe and are a pain to sharpen. I was really excited to get this new set. I liked that it came in a set of three different sharp knives so I could tackle any cutting task in the kitchen. The serrated paring knife and the regular pairing knife are 4 inch blades. The red chef’s knife has a 7 inch blade. They are all dishwasher safe, although Kuhn Rikon suggest hand washing and air drying. The Colori+ sharp knives each come with their own protective sheath. The knives just slide right into the sheaths. When I was 8 years old, I tried to cut an apple in half with a butcher knife. I was holding the apple with my right hand and cutting with my left hand (I’m right handed) you can guess how well that ended…. I STILL have that scar on my right hand! I don’t want that to happen to my children, so I am teaching them. My 7 year old loves to cook with me and under constant supervision I am teaching her how to carefully cut ingredients for our dinner. It’s nice to know that when one knife isn’t in use it can be covered or she can safely practice while we are waiting for things to boil. The recommendation on the knife set says not for children the blade is sharp, store with protective sheath, improper use may result in injury. 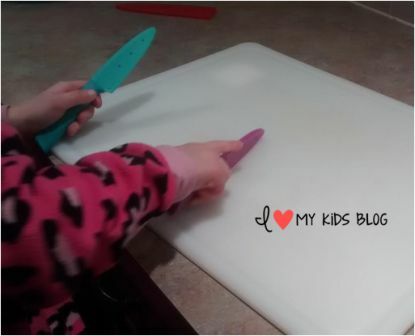 Don’t worry, I don’ let my 7 year old play with knives ever! Having the protective covers is a big thumbs up in my book! 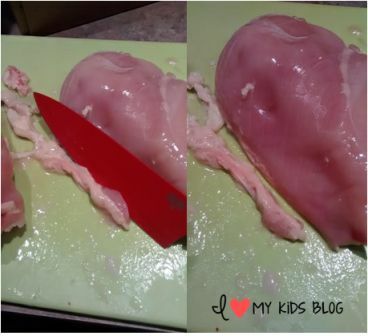 The very first day I got these knives I put them straight to work cutting up some chicken for dinner. 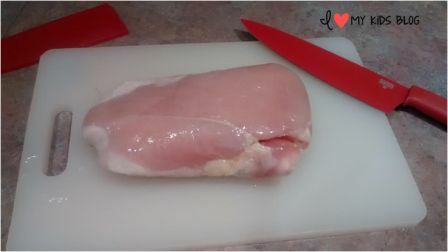 It had been thawing all day and In my opinion thawed chicken is the trickiest to cut. I was pretty impressed with how well the red chef’s knife handled the task. The blades are Japanese stainless steel and they have a silicone based nonstick coating that ensures food will not stick to the blade. After I had owned this knife set for 4 days my husband cut about 80 lbs of deer meat so we could make jerky and sausages. A few days after that I picked up 80 lbs of chicken from a bulk supplier and needed to trim and wrap it for the next 6 months worth of meals. This knife made the trimming part go so fast! The chef’s knife has gotten a ton of use at our house in the last week already and is still as sharp as day 1! 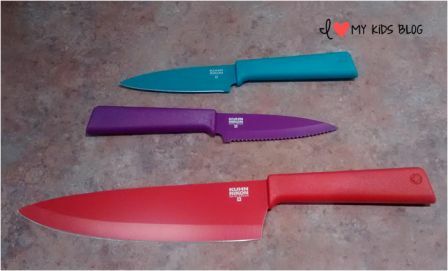 The purple serrated pairing knife is good for slicing bread, fruits, tomatoes and other softer foods. 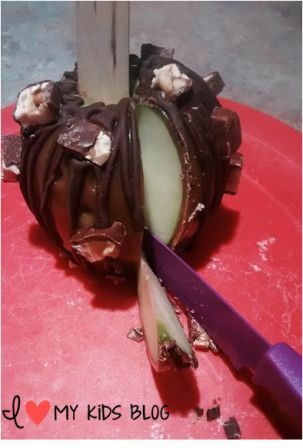 Over the course of the week, I used the purple knife to cut into a homemade snicker’s caramel apple as well as cut up some cantaloupe and tomatoes. The aqua colored knife is the prettiest one in my opinion and is great for slicing cheese, peeling an apple or for chopping. 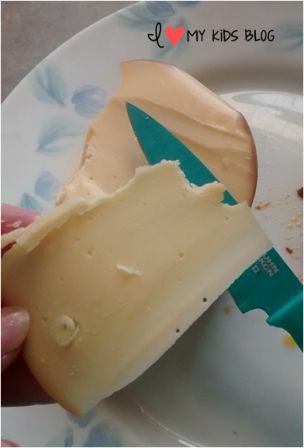 I used it this week to slice cheese for the kid’s school cold lunches and to sneak some slices of Smoked Gouda cheese after the kiddos went to bed! I’ve gotten a lot of use out of these Colori+Kuhn Rikon sharp knives already and it’s only been about a week! This culinary knife set is just $30 on the Kuhn Rikon website and right now until 12/31/15 you can get free shipping (in cont. US) on orders over $20 by typing in coupon code “FREESHIP“. Awesome, right? You can also find Kuhn Rikon on Facebook, Twitter, Pinterest, and Instagram! What is your favorite feature of this knife set? Is it the great colors? The sharp blades? The awesome price? Leave me a comment below letting me know! Giveaway time for these awesome sharp knives! 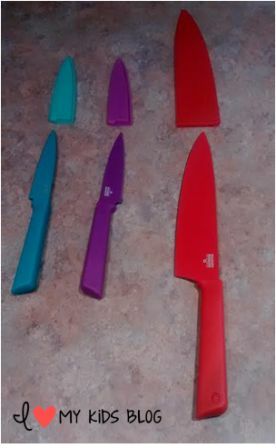 Kuhn Rikon has offered to giveaway a set of these Colori+ knives! To enter just fill out the Rafflecopter form below! I will email the winner (via the email submitted to Rafflecopter) and they will have 24 hours to reply. This giveaway will end December 5th at 11:59 pm Eastern time and is open to cont. US only. Special thanks to Kuhn Rikon for hosting this giveaway! It would be great if you could give them a little social media love by liking/following them-the links to their social media pages are int he Rafflecopter! Good luck! Congrats to Shanna! Enjoy your new knife set! Disclosure: I received the knife set mentioned above so I could form an opinion to share with you. Regardless of this arrangement, I was not required to give a positive review. All opinions expressed above are my own honest thoughts. Thanks for reading! I like the Jui knives. I really like their Dog Knife – Serrated. I like the Classic Art set of knife set. The garlic peeler is really cool,I’ve never heard of one before. I could really use the tomato knife. No more smashing tomatoes! So fun. These look neat!! Oh ha I hope I win! I’d love new knives!!! I like the Bread Knife Colori® in black. I would like the JIU Serrated Paring Knife. The description on their site says it is a handy all-purpose knife. I think I would get a lot of use out of it. Colori Art Chef and paring knife set in black is so cute. A must have for my kitchen!! Art meets function!! The Jiu Chef’s knife is absolutely gorgeous. I would love one of those! The Jui knives are beautiful! I like the Citrus knife. The corn zipper is really nice. It would come in handy at my house now. I have two grandchildren who have lost their frontteeth at the same time.